Mumbai, Oct 31 (IANS) Key Indian equity indices on Tuesday traded on a flat-to-negative note during the mid-afternoon session on the back of broadly negative Asian markets, coupled with heavy selling pressure in metals, automobile and IT stocks. 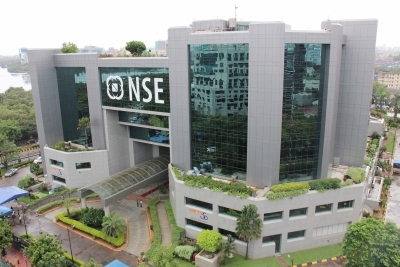 Around 12.45 p.m., the broader Nifty50 of the National Stock Exchange (NSE) traded lower by 12.95 points, or 0.12 per cent, at 10,350.70 points. The barometer 30-scrip Sensitive Index (Sensex) of the BSE, which opened at 33,254.93 points, traded at 33,241.75 points — down 24.41 points or 0.07 per cent — from Monday’s close at 33,266.16 points. The Sensex has so far touched a high of 33,294.30 points and a low of 33,174.99 points during the intra-day trade. However, the BSE market breadth was bullish — 1,314 advances and 1,201 declines. “The benchmark indices traded flat on Tuesday tracking sluggish trend seen in Asian markets after Wall Street pulled back from record-high territory overnight,” Dhruv Desai, Director and Chief Operating Officer of Tradebulls, told IANS. “Back home, as many as sixty nine companies are scheduled to report results for quarter. These include Bharti Airtel, Dr Reddy’s Laboratories, IDBI Bank, Syndicate Bank, SBI Life Insurance Company, Dabur India, Strides Shasun, KPIT Technologies, and Divis Laboratories, among others,” Desai added.